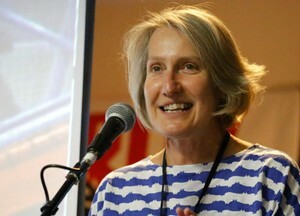 Sue Bolton is a longtime socialist activist and the Victorian convenor of Socialist Alliance. She was elected to the Moreland Council, which covers the inner northern suburbs of Melbourne, in 2012. She will be a featured speaker at the Fightback conference in Wellington in May. She was interviewed for Fightback by Bronwen Beechey. Fightback:There is a debate in the socialist movement about whether socialists should participate in “bourgeois” elections. Obviously you think they should, why do you think it’s a good idea? SB: I think it is important for socialists to stand for election for several reasons: it gives you a forum for putting a socialist viewpoint on a wide range of issues, not just issues where there are campaigns. In Australia at the moment, campaigns tend to focus on moral issues such as human rights or environmental issues but there are few campaigns around economic issues. Elections give an opportunity to socialists to put an alternative to neoliberalism. It is a good way of building the party and also a socialist or socialist-leaning milieu or base in an area. Fightback: Do you think that your election was due to the issues that you campaigned around, or your profile as a long-time activist in the area, or both? SB: I think it was both. There are people who know me from the union movement, including picket lines, the refugee rights movement, the Middle East Solidarity group and the climate movement. Some of the residents who didn’t know me or Socialist Alliance voted for me because we campaigned to put community need first, not developer greed. Fightback: What were the issues you campaigned around? SB: We took up a mix of local and broader issues. A central issue we campaigned on was opposition to developer greed, for developers to bear the cost of providing amenities, for mandatory height limits and more green spaces. We called for a campaigning council that would campaign for more public transport, against the sell -off of public housing and for ethical investment. We campaigned for expanded bike paths, solar power and against gas-fired power generation. We campaigned for a council that helps its residents with cost of living pressures, including that residents not be pushed out of their home because they can’t afford rates and that rates shouldn’t be increased above the level of inflation. This is because rates are not an equitable means of funding local government services. A pensioner or an unemployed person could be living in a house which has risen in value because of gentrification, but they can’t afford massive rates even though their house has risen in value. We also campaigned for regular ward accountability meetings. Fightback: What has been your experience working in the council? Is it a hostile environment, or do you have supporters there? Have you any formal or informal links with other socialist or left councillors? SB: The council is very conservative with a Liberal Party councillor, a Democratic Labor Party councillor, two Greens councillors, six ALP councillors and me. Then there is the council bureaucracy which is also very conservative. The council meetings aren’t necessarily hostile. It’s more that the council bureaucracy and the other councillors are trying to take you on the same path as them, which is a neoliberal path. The problem is more one of co-option rather than direct hostility, although that exists as well. Fightback: How has the Abbott government affected Australian politics at a national and a local level, particularly its impact on working people, the poor and oppressed groups? SB: The worst aspect is the Abbott government’s use of sharp racism, in particular against refugees, to hide its attacks on working class living standards. The government is appealing to the more conservative section of the working class in order to rule. At the same time, it is attacking unions by attacking corruption in unions. Unfortunately, a couple of real examples of corruption have been uncovered. These have undermined workers’ confidence in unions, which in turn has made the unions more scared about responding with industrial action. Most industrial action is illegal, so the only way of responding to the attacks is with “illegal” industrial action. It is necessary to take industrial action regardless of whether it is legal or not, but most unions are avoiding taking any industrial action that might be deemed “illegal”. It’s also the case that if unionists or unions refuse to pay fines for taking industrial action, the law allows the government to sequester the fine from individual’s or union’s bank accounts. The government has succeeded in demoralising people because people can’t see a fightback coming yet. Fightback: Do you think the recent “Marches in March” against the Abbott government represent a new phase of opposition to neoliberal policies? SB: The marches were fantastic, especially given that the union movement hasn’t mobilised its members against the Abbott government yet. The size and number of marches undercuts the government’s argument that it has a mandate for its cuts. Around 100,000 people marched against the government at March in March. The dominant issue that people brought homemade placards about was the government’s inhumane treatment of asylum seekers, followed by climate/environment issues, then many other issues. Fightback: Some on the left argue that the best strategy to beat right-wing governments is to vote for Labour parties as the “lesser evil,” or that Labour can be transformed from within. What is your response to those arguments? SB: The left has tried to reform Labor from within ever since the ALP was formed. It’s never worked. The only times that Labor governments have ever carried out any progressive reforms are when there has been a strong communist/left movement outside the ALP. In fact, I would argue that the ALP doesn’t just play a reactionary role when in government; it also has a damaging effect on unions. The ALP is always influencing unions to not put forward their interests strongly; it is influencing unions not to take industrial action. Unions’ affiliation with the ALP is a vehicle for the capitalists to influence the unions. Unions have very little ability to influence the ALP to adopt pro-worker policies, despite their affiliation. Fightback: As a member of Socialist Alliance, what is your perception of the recent breakdown of unity talks between SA and Socialist Alternative? Do you think there are still possibilities for greater unity on the Left? SB: I think there were different conceptions of what sort of organisation we each wanted to build. There were some differences which would have needed to be explored before unity could have been possible, but there was never an opportunity to do that before the unity talks broke down. However, there’s always another struggle and another day. There will be opportunities in the future for left unity but these opportunities will probably arise as a result of new political developments. Fightback: As a long-time feminist, do you think that there are still difficulties for women participating in mainstream political bodies such as councils? Have you experienced sexism from other council members, or from the community? SB: There have definitely been sexist attitudes exhibited by a couple of male councillors. On Moreland council six of the eleven councillors are women. I might have experienced more sexist attitudes if the numbers were different. The problem is more that the council and councillors are good on women’s rights issues on paper but in practice they only pay lip-service. The real issues of sexism come about at a much earlier stage and are more to do with women’s ability to participate in society because they face family violence, are living in poverty on single parents pension or a low paid job as a single parent, don’t have the money to access expensive childcare or other services, or have low self-esteem. You can also see a certain sexist approach with the murder of a local Brunswick woman by a male stranger on the street towards the end of 2012, which resulted in a big Reclaim the Night march of several thousand people. The council turned this issue into a law and order issue, rather than dealing with it as an issue of violence against women. The biggest source of violence against women is from intimate partners in the home. Fightback: Some left-wing councillors and former councillors have commented that the relatively privileged role of a councillor (getting free passes to events, socialising with business people, etc) can influence progressive councillors and distance them from their constituents. How do you stay accountable to the community? SB: That can certainly happen. You have to be very conscious about what you’re on the council for. Unlike state and federal government, councils are portrayed as being a “team” where party politics and an oppositional approach don’t apply. This is all part of trying to recruit all councillors to “respectable” neoliberal politics. It’s important to be aware of the fact that many of the councillors and council officers regard residents as pests, and use language to cover up the pro-business outlook such as talking about all the “stakeholders” as having equal interests. This is a way of legitimising giving more say to businesses and developers than to residents. The accountability is mainly via reportbacks on council activities on Facebook and the blog site (http://www.suesmorelandreport.org). In addition to this, I report back to Socialist Alliance meetings and we initiated Moreland Socialists for anyone who is left-wing and wants to support our council position. We have organised some ward meetings, but we want to get more regular with these.